THE answer to the national football squad’s shortcomings at major tournaments could very well be found at Knaphill Athletic Football Club. Or at least, that’s certainly how it looked on Saturday, as a member of the Football Association’s top brass, Chairman Greg Dyke, took in a few local fixtures. The FA chief, who splits opinion on the terrace, was taking in some grassroots action prior to watching Woking squeeze past Boreham Wood in the FA Cup at Kingfield. 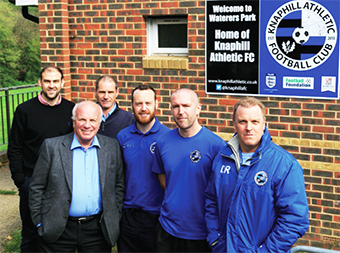 There to greet him at Knaphill’s Waterers Park home were Surrey FA Development Manager Paul Jones, Club Treasurer Kevin Barkham, Knaphill’s captain Edwin Doyle and manager Des Clark, and Chairman Dean Roberts. His appearance coincided with a recent commission to examine the decline in English players appearing for top clubs.